Adapts the Sig Sauer P320 and P250 Full Size 9mm, .357 Sig and .40S&W magazines to fit P320 & P250 Sub-Compact models. Works with new style P250/P320 Sub-Compact grip module ONLY. Increases capacity. No tools are required for assembly. It works as advertised and provides a comfortable place to put the fifth finger. 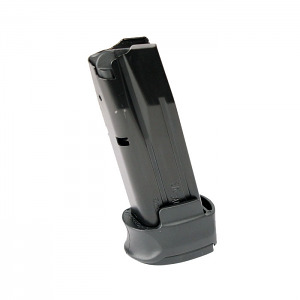 Unfortunately,one must buy extra regular size magazines to use in the subcompact P320 to take advantage of the X-Grip, since Sig is too cheap to make a subcompact mag with a grip extenson like every other manufacturer does! The two extenters I purchased did not fit my SigSauer P320SC magazines (12 rounds) because the bottom hole was square, not circular. 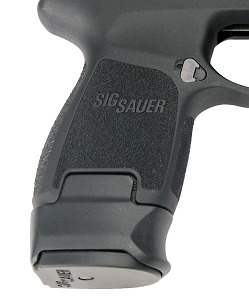 Because the two SigSauer magazines (12 rounds) with the square hole in the bottom of the magazine did not allow me to insert the magazine properly into the frame. I had to buy another 17 round magazine (with a square hole in the bottom) that the extender would fit on and allow me to insert the 17 round magazine into the frame and lock in place. I had an armor cut off a significant amount of one the extenders in order to use it on the 12 round magazines. I wish I was more knowledgeable about the differences in the magazines. In looking back at my initial purchase, I should have bought the larger 17 round magazine. After searching for what seemed like ages, they arrived promptly! And it is definitely appreciated.